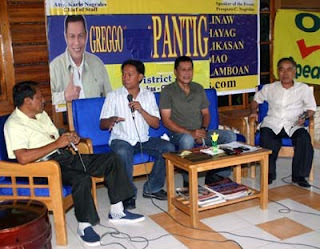 Greggo Pantig (3rd from left), action officer of House Speaker Prospero Nograles, during a recent public service radio program Oplan Kalambuan sa Barangay in Davao City in Mindanao. DAVAO CITY, Philippines – House Speaker Prospero Nograles has expanded his humanitarian programs in Davao City and now caters to a wider area helping the poor. Nograles, who belongs to the 1st District of Davao City, has widened the scope of his programs to include residents in the 3rd District as well after residents appealed for help and support. The solon has opened a satellite office in Daliao in Toril District to bring his noble and service-oriented programs to mostly poor residents. Nograles’ action man, Greggo Pantig, said those residing in the 3rd District can now avail of various humanitarian programs of the lawmaker and his son, civic leader and lawyer Karlo Nograles. The humanitarian programs include health care, education, infrastructure, skills training and livelihood. He said those who needed medical care can also avail of Nograles’ Congressional Medical Assistance Program at the Davao Medical Center.